It’s time to make plans to attend the 2016 CP of NYS Annual Conference, October 17–19 at the Hilton Albany Hotel in downtown Albany. This year’s conference will include a celebration of the 70th Anniversary of CP of NYS. Photos and videos will help us highlight some of the achievements of CP of NYS and our family of Affiliates over the last 70 years. We have educational sessions planned on Managed Care readiness; Crisis Communications; Family Advocacy; a presentation about Upstate CP’s Smart Home and other BIP projects; and an explanation and demonstration of Litmos, our new on-line training platform. OPWDD Acting Commissioner Kerry Delaney will speak at our Kickoff Luncheon on Monday, October 17. We will also have presentations from representatives from the NYS Education Department. Check our website (www.cpofnys.org) often in the coming weeks for updated information on the CP of NYS Annual Conference. We have asked Affiliates to submit short videos with various people from their Affiliate talking about CP of NYS to be shown during the program at our Monday Night Annual Awards Dinner. Finally, we are also asking that you send us 8 to 10, 5” x 7” photos depicting people and services from the different eras in your organization’s history. Many Affiliates have already submitted videos and photos, we ask that any Affiliate that has not sent them to please do so. This year’s Annual Awards Dinner will include the presentation of only one award, the Al Felmet Achievement Award. In addition, we will highlight, through the use of video and photography from our Affiliates, some of the major events and accomplishments of the first 70 years of CP of NYS. Registration will open soon, so please visit our website at www.cpofnys.org for all the latest information. Send an email to all of the audiences listed above and ask them to ‘Like’ the bFair2DirectCare Facebook Page and ‘Follow’ the bFair2DirectCare Twitter account. Post to your Organization’s social media accounts, asking your social media network to ‘Like’ the bFair2DirectCare Facebook Page and ‘Follow’ the bFair2DirectCare Twitter account. Interact with the bFair2DirectCare social media accounts by liking, sharing and commenting on posts and tweets! Please visit and interact with our social media accounts often. On June 30, OPWDD Acting Commissioner Kerry A. Delaney said that changes to the housing priority categories will make sure that people living at home with their families have equal access to housing opportunities based on their need. Read the complete announcement here. Today there are many important issues facing people with disabilities and those who support them. Cerebral Palsy Associations of New York State, our Affiliates and our partners in coalitions such as the Coalition of Provider Associations (COPA) and the bFair2DirectCare consortium of organizations are working with friends and supporters across the state to make government officials and the public aware of the critical need for increased support for people with disabilities and the staff that work with them daily. You, your colleagues, friends, neighbors and family members can do even more. If you have not done so, register to vote, and then turn out at the polls on November 8 to make your voice heard. It is easy to do and there are many different ways to register, but you must be registered by October 14 to be eligible to vote in the general election. Listen to the candidates, tell them what you need them to do for you, and then vote for those who you believe have your best interests at heart. Information on how, when and where to register to vote, as well as other information on voting, can be found on the NYS Board of Elections website and on the New York Families for Disability Rights website, recently created by CP of NYS to be used by families and advocacy groups across the state to share and gain information, speak with other families and communicate with our elected officials to advocate on issues concerning people with disabilities and their families. Below is some basic registration information. You can enter your name directly into the mailing list database on the Board of Elections website to have a New York State Voter Registration Form mailed to you. You can call the 1-800-FOR-VOTE hotline to request a voter application. If you are registering by mail, your applications must be postmarked no later than October 14th and received by a board of elections no later than October 19th to be eligible to vote in the General Election on November 8, 2016. For more information, or to register to vote please go to the website below. The Division of Person Centered Supports – Employment Unit is conducting a series of Technical Assistance Webinars to connect Provider Agencies interested in creating integrated businesses to resources and expertise from across New York State. Entrepreneurial Assistance Program – EAP helps entrepreneurs to create new businesses by providing instruction, training, technical assistance and help obtaining funds. Services include business plan, marketing and product development and business support networks. Small Business Development Center – SBDCs help potential and new business owners open and sustain their business ventures. Services are flexible and tailored to every client. Learn more about their entrepreneur center. For questions or more information please contact Mary Pellman at mary.n.pellman@opwdd.ny.gov. We are pleased to announce that Melissa Armstrong has joined the Affiliates Services staff as Executive Secretary. She began her duties on August 1st and will be interacting with Affiliate staff on a regular basis. Melissa brings 9 years of professional experience in sales and customer service. She studied computer information systems at Schenectady County Community College and has experience working in a variety of computer programs and software applications. She will serve as the initial contact person for most interactions with the Affiliate Services Office and will be a liaison between Affiliates and Affiliate Services staff, answering questions and directing requests as appropriate. She also handles scheduling and correspondence for Affiliate Services staff and assists with coordinating details for the CP of NYS Annual Conference and other meetings and trainings. Please join us in welcoming Melissa to the CP of NYS family. Rochester Rehabilitation was recently awarded a $4 million grant from the Federal Department of Labor enabling the agency to partner with other organizations and Rochester-area employers to create access to living-wage jobs, and support career advancement for parents with dependent children at home. Job training, job placement, career advancement, benefits management, and child support will be available. The award is part of a larger $54 million nationwide grant secured by the Department of Labor through its Strengthening Working Families Initiative. Rochester Rehabilitation’s award is one of 14 in the nation and the only one awarded in New York State. The agency’s Employment Connection programs serve people with disabilities and other disadvantages. Rochester Rehabilitation has aligned with CP Rochester as part of a passive parent corporation, Ability Partners, Inc. which also includes CP of NYS Affiliate Happiness House in Ontario County. The addition of Rochester Rehabilitation to Ability Partners Inc. has enhanced the scope of high quality services provided by all three organizations. Empower, formerly known as Niagara Cerebral Palsy, recently won one of the two top Excalibur Awards from the Public Relations Society of America Buffalo Niagara Chapter. Empower received the “best of show” Platinum Award in the campaigns division for its rebranding campaign, which introduced the new Empower name, logo and brand identity. The rebranding campaign received a perfect score from the judges and was selected as the top entry among all of the Gold Award winners in the campaigns division. Empower also received a Silver Award in the tactics division for a published opinion piece on the need to raise wages for direct support workers in the developmental disabilities field. All entries were judged by public relations professionals from the Dallas Chapter of the Public Relations Society of America. The game between the Racker Center All-Stars and the Big Red, a family skate and BBQ raised money to support programs at Franziska Racker Centers. 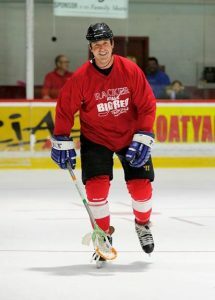 Three-time Stanley Cup Champion Joe Nieuwendyk having a little fun at Racker Rivals Hockey game in Ithaca on August 6.